Silver Owl Pendant - Unique Handmade and Hand Painted - Wearable Art! This beautiful owl proudly displays a piece from my latest painting. It features stunning teal/turquoise colors blend with a soft white contrast. Price includes a 20” silver chain. If you’re looking for the perfect gift for your wife, girlfriend, mom, sister, best friend, teacher, neighbor, or YOURSELF... this is it! It’s not *just* jewelry and it’s not *just* art, it’s a piece of artwork you can wear... wearable art! Treat yo’ self! Or for the one person on your list that already has everything. Since each piece is made from original artwork, you can guarantee they won’t have one like it! I use paint left over from my canvas work, to create these stunning and unique pieces of jewelry. Each piece is completely different and no two will ever be the same. 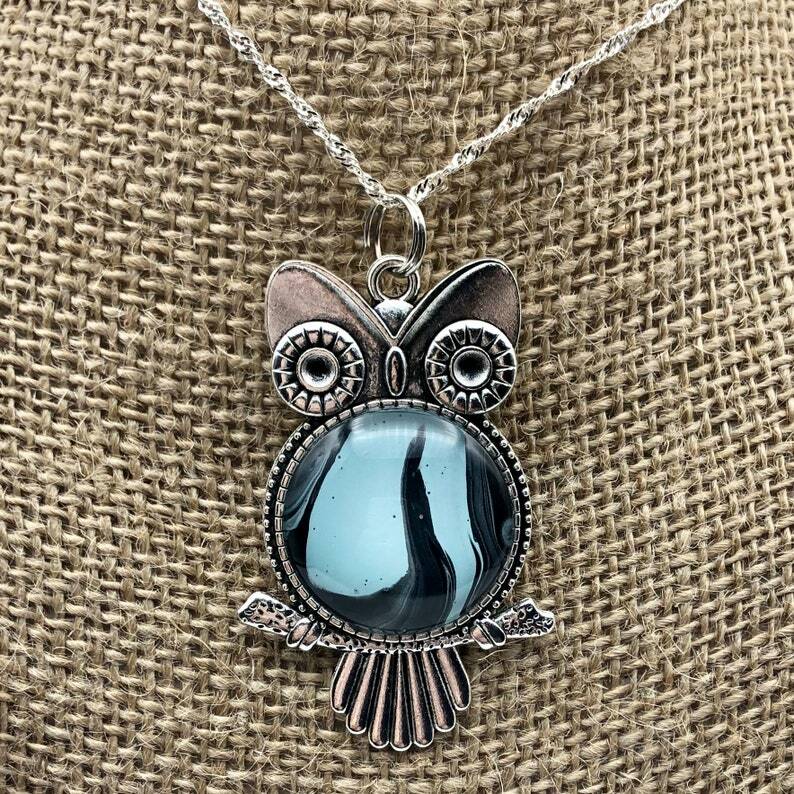 Bronze Owl Pendant - Unique Handmade and Hand Painted - Wearable Art! Silver Owl Pendant and Earrings - Unique Handmade and Hand Painted - Wearable Art! Silver Circle Pendant and Earrings - Unique Handmade and Hand Painted - Wearable Art!